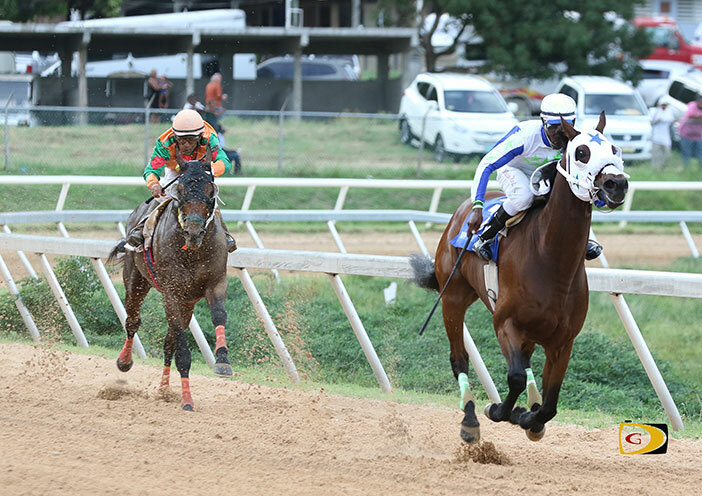 When it comes to winning on his home turf, Lesmore Smith horses have a tough time. Coming off his third St. Thomas Carnival Governor’s Cup victory since 2011, his Giant Valley could only watch My Pal Shawn sprint away from him in a 7 Furlongs match race at the Ellis Thomas Downs in Sunday’s feature race—after Call Daddy who was expected to make his debut—became the fourth of five St. Thomas horses on the card to scratch. My Pal Shawn set a blistering pace from the gate and controlled the race. Just when it seemed that Giant Valley would begin to challenge My Pal Shawn on the back stretch, he accelerated and Giant Valley had no response and romped a four lengths victory in one minute 31.3. Honors, Lake’s other horse, gained a 2-1 victory edge over Smith’s Bellamy Chief in their heated rivalry with St. Thomas’ Bras Note also in the field. Honors repelled Bellamy Chief’s charge for a easy runaway seven lengths victory. He was time in 1:34.4, going gate to wire. Brass Note followed Bellamy Chief home while Explosive Image of St. Thomas scratched. Atorrante and the Big Meow engaged in a duel over the 7 Furlongs sprint in the day’s third race for Class B and C horses, after Returning Rock stumbled out the gate. Atorrante kept fending off the Big Meow and when he made his last move on the back stretch, Atorrante stepped on the gas opening a lead that grew to eight lengths by the time he crossed the line in 1:33.2. Returning Rock overhauled the Big Meow for the show spot. St. Thomas’ Untie The Knot was scratched. The card kicked off with LB Thunder burying Sir Whisky and Gottocha Bob in the 6½ Furlongs sprint for Class E Horses, covering the circuit in 1:27 flat while romping to a seven lengths victory. Meddling Birdie took the second race on the card, a 7 Furlongs run for Class D Horses. He had a winning time of 1:35.2, avenging a loss to Yes By Eric in March and Buy, Buy, Buy in February. Mark It A Wynn rounded out the field. Go Pancho Go of St. Thomas was scratched.